Concrete Leveling - LOCAL COLORADO SPRINGS MUDJACKING & FOUNDATION REPAIR COMPANY! Through our many years of concrete leveling in Colorado Springs we have seen that anywhere concrete has been poured on unstable soil, there is a possibility that it has settled. This is very common around pool areas, garage floors, homes or slabs on grade, at the base of steps, patios, and walkways. Most of this settlement will happen within the first five years resulting in the failed or settled concrete. Our complete concrete leveling and slab repair will help bring your concrete back to its originally poured height. Once the base soil under the slab has reached full compaction, we are able to repair the slab. This is done by drilling a series of 1″ or 1 1/2″ holes based on the type of slab and job. Then a sand/clay/cement grout is mixed and pumped beneath the slab. Once any voids are filled, pressure begins to build and raise the slab. After the concrete has been raised, the drill holes are cleaned and patched with a fast-setting high-strength cement. 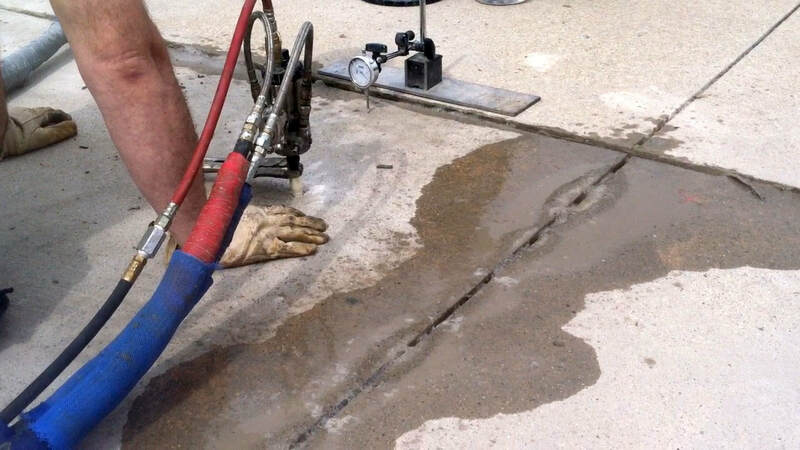 We use this proven technique in our concrete leveling services. Call Today For A Free Onsite Estimate!